I love to browse through hundred-year-old magazines. Sometimes I just need to smile. Today, is one of those days. Here is an important “warning” in the March, 1915 issue of Farm Journal. 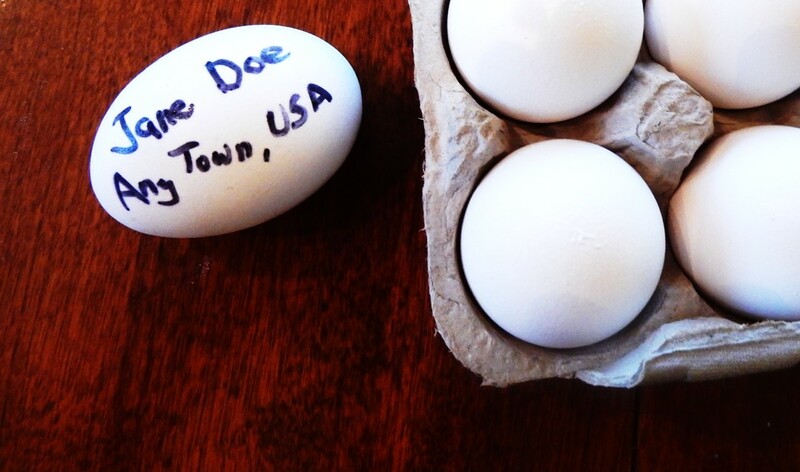 It is time to put a stop to that silly, dangerous practice some girls have of writing their names and addresses upon eggs and packages of produce sent out from their home farms. I once overheard a well-known man-about-town, whose character is not what it should be, boast to a circle of men friends that, in connection with the boiled eggs served him for breakfast, there was the name and address of a girl he hoped would prove a rustic beauty; and that he had already begun a correspondence with her. Now is not this a situation to make all decent, respectable persons sit up and take notice? Eggs then, Facebook now. times don’t change! I agree–the technology changes, but people then are like people now. So like the social media warnings of today! Young women trying to escape the isolation and boredom of their farm life. Do you think this is something your grandmother would have done? hmm. . . Yes, I think that could see her doing something like this. I like how you describe why young women did it. Somehow it seems like a fairly harmless way to add a little fun to their lives. I love the analogies. They work perfectly. You have made my day. I will be giggling about this all day long. I would have guessed that the cook would have wiped the egg clean. I love all the responses here! They all crossed my mind. Of course, the warning was to the girls (potential “victims”) and no admonishment to the potential perpetrators. Things have hardly changed. I had similar thoughts. At least we now realize that there are perpetrators, and hopefully that is leading to some positive changes. 🙂 The methods change, but the concerns are the same. Somehow, by today’s standards, it seems very quaint. It makes me think of messages in bottles. I still throw the odd one in!!! Every time I see a bottle on the shore, my heart quickens as I look to see if there’s a message in it! This reminds me of something . . . and I can’t quite come up with what. Young women including notes with the socks they knit for Civil War soldiers? Maybe–I’ll have to go look for it. A friend of mine put her business card in a handsome stranger’s coat pocket at a bar once–it turned into quite a nice relationship! I think I once heard that the “Rosie the Riveters” who assembled airplanes during WWII sometimes hid notes in the planes that they hoped the pilots would find. I hadn’t thought about it from that angle; but you’re absolutely right, it would seem really, really weird if I opened an egg carton and saw an egg with a note on it. That’s so funny. I think I would be worried to find a person’s address on my egg but I can see potential for some fun greetings or egg art to liven up the egg tray and the customer’s day. I hadn’t thought about it quite that way–but I can see how it could be concerning to get a person’s name on an egg. Why did they write their name on the egg? Are they being held hostage or something? Aging has many advantages, not to mention fewer cavities and reduction in allergies. Oh my goodness — if the egg writing naysayers could get into a time machine and suddenly be in 2015 they’d probably be shocked. LOL just picturing it. Very interesting reflection! Like it. It nice to hear that you enjoyed it. I LOVE THIS! Totally made me laugh. These are the problems that had back then! Wish we could have problems like this now in days.